We had the pleasure of reviewing a physical copy of the Exploring Creation with Health and Nutrition Basic Set by Dr. Laura Chase, which is published by Apologia Educational Ministries. 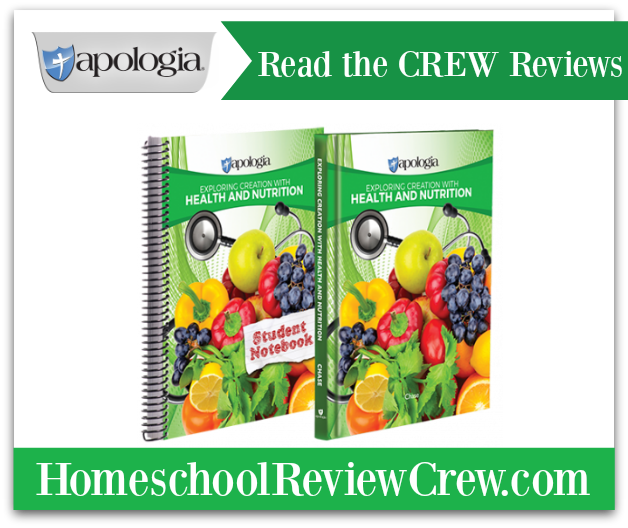 I have been a member of the Homeschool Review Crew for almost 10 years. One of the first products I remember reviewing was a Bible study curriculum from a new to me company called Apologia. It was a rising Christian publishing company being led by Davis and Rachael Carman. I was not only attracted to how engaging and comprehensive the Bible study was, but also to the heart of the Carmans and their ministry through Apologia. The company mission as publishers of curriculum and resources that equip students and families with knowledge to “learn, live, and defend the Christian faith” is apparent in the products I have had the opportunity to review as well as the ones I have purchased to use in our school. Over the years, I have seen the company vision become a reality with the increase in variety of curriculum for students in kindergarten through the twelfth grade. We have continued to include Apologia products in our school every year. This year, River and Lily are using Apologia Biology and Apologia Physical Science, respectively. Health and nutrition is a required course for graduation in our school, so I already had a curriculum chosen for those years. I was not impressed with the study, but it was going to serve the purpose, so we were ready to use it for high school. Earlier this year, I learned Apologia was releasing a health and nutrition study. I cannot tell you how excited I was to learn that news. I have so many favorites from the company and knew this one would be added to that list. We had the opportunity to review a physical copy of the basic set of Exploring Creation with Health and Nutrition by Dr. Laura Chase. The curriculum is a 34-week study that is geared towards students in the eighth through twelfth grades. Although it is scheduled for 34 weeks, students may choose to complete the 15-module program in one semester. Because of the content that is covered, I think it is best to follow the 34-week schedule. That will allow students time to discuss any of the covered topics, shown below, at length. As you can see by the titles of the modules, there are a lot of different areas of health and nutrition that are discussed. This is a full health textbook – it does not shy away from some taboo or sensitive topics. That is one of the things I really like about the study. Apologia even has a parental note on its website regarding the content covered in the study. The suggestion is for parents to decide, before their child uses the study, if the child is mature enough to discuss some of the topics included in the curriculum. Some of those topics include drug and alcohol abuse, depression, sexuality and sexually transmitted diseases, both the male and female reproductive systems – with appropriate illustrations, and other areas of health maintenance that should be discussed with your teens. I do not think that eighth grade is too early to discuss some of those issues in life. In fact, they are ones that parents are now having to discuss earlier, because of how our world is evolving. Exploring Creation with Health and Nutrition takes a mature look (appropriate for teenagers) at both areas and sets a foundation for them to build upon for the rest of their lives. 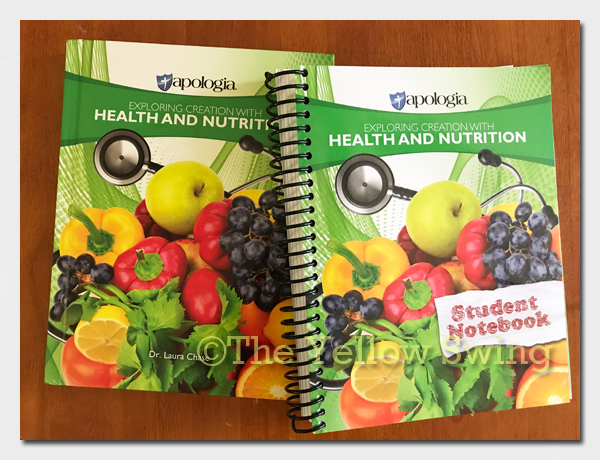 The Health and Nutrition Basic Set comes with a hardback textbook and a spiral student notebook. The hardback textbook is colorful and full of a lot of content. There are not a lot of pictures, because there is so much to say about health and nutrition. 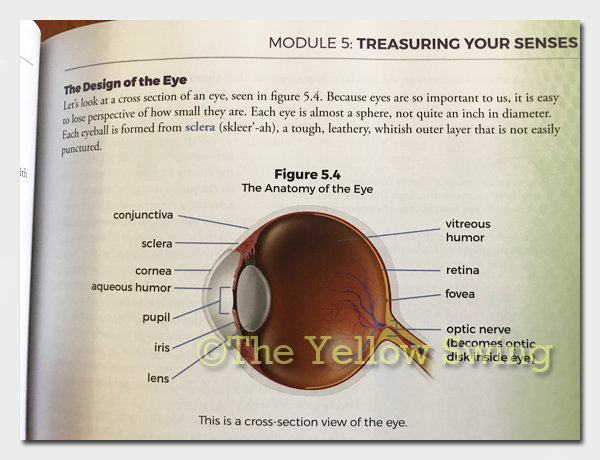 I think the textbook is a great example of what your child can expect as they continue to advance through the high school years and especially into college; most textbooks have hundreds of pages with content to learn and not many pictures. The pictures that are included in the textbook are vivid and detailed. A student can read through the textbook for basic knowledge, but the student notebook is required to thoroughly benefit from the study and also earn high school credit. 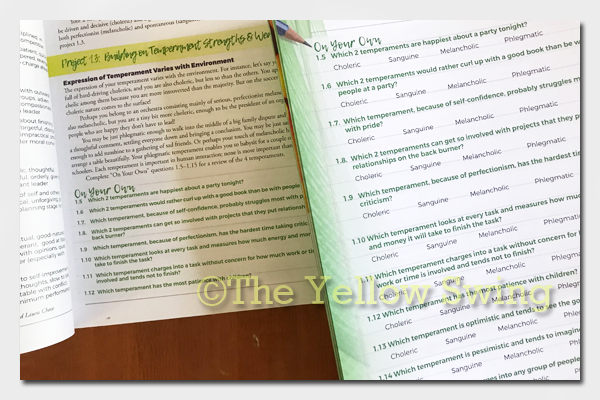 Just like with other studies from Apologia, the student notebook provides additional activities and cements what the student is being taught. Each module begins with a notes section of blank sheets for students to write notes. The textbook includes some exercise sections like “On Your Own”, “Study Guide Review Questions” and “Project” assignments. 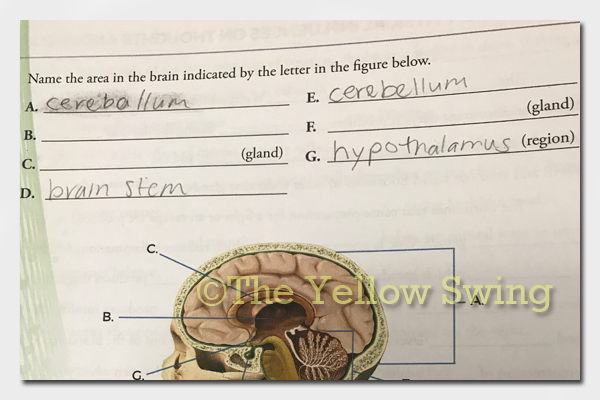 The student is able to write those responses in the student notebook. Also in the student notebook are the module tests, and a guide for parents/teachers about how to evaluate Modules 9, 12 and 14, which include notebook projects. The student notebook puts more focus on the module topic, then there are activities that expound on the focus, and then student notebook tests your knowledge of the focus. The answers to the textbook and student notebook activities are available online at the Apologia website. Those pages may be downloaded. One of the notebook projects (ex: Modules 9, 12 and 14) uses the data collected in Module 7 – Food Science 1 – Macronutrients, where students look at food and how it affects their bodies. They complete a three-day food diary and later use it in Module 9 analyzing the number of calories, carbs, fat, fiber, etc. and its affect on the human body. Students are also encouraged to evaluate the food choices they made and look for ways to make them more nutritious. The password is included on a textbook page. I had every intention of completing more of the study during the summer, but life happens – unplanned travel and unexpected sicknesses. Interestingly enough, something like that (sickness) tied well into the study, but we were not yet into that module (Module 13). I also finally decided I wanted to work through the curriculum with both River and Lily, simultaneously, because of some of the topics that we would be discussing. are covered. Why put off important discussions, because she is only in the ninth grade. She was not able to complete the student notebook work, because I am still waiting on my backorder to be delivered. We still did start the discussion. Throughout the textbook (study), the science of health and nutrition is presented along with the relationship or connection with creation. Students see how creation comes into play with everything. You can’t dismiss God! • layout and design of the book. I love, love, love the cover design. • pictures are racially inclusive. • I like that each module is not just reading, but has activities. One of the things I really appreciate from Apologia is the suggested schedule it includes with its different studies. Granted, you may work through the curriculum on your own schedule, but having a planned one helps. Now that my children are in high school, knowing the amount of work that is expected to be completed over the course of a semester or a school year to earn credit is extremely helpful. I think it would be great if the Module test pages were a separate packet that came with the basic set, instead of being pages in the student notebook. I let River use his notes with the Study Guide Review Questions and prefer the test to be completed without his notes. Having them in a separate packet would eliminate any temptation to peek. Looking at our course load for ninth and tenth grades, we are going to continue to follow the two semester, 34-week schedule. Exploring Creation with Health and Nutrition Basic Set by Dr. Laura Chase is a head-to-toe, comprehensive study about health and nutrition. You may purchase Health and Nutrition Basic Set for $85.